Please help, I promised my son I would submit his costume for your contest. I was waiting for some better pictures from my father in law but he kept forgetting and when I didn’t get them last night I forgot to submit even one picture. I’m feeling like the worst mother ever, since he was so proud of his costume and I asked him about submitting it. I don’t care if I don’t qualify for the money in the contest, but would love if he was considered. Thank you the ever late Mom. My son Jack is 7 and loves his iPod…he’s destined to be a computer engineer or run the “Geek Squad” at best buy…at 7! 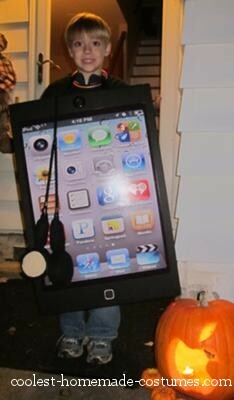 He wanted to be an iPod for Halloween and started dreaming it up this summer. We got a piece of black presentation board from a craft store and attached a fat black ribbon with duck tape so he could “wear it”. My husband works in an engineering office where they have a large color printer for printing maps and big presentation posters, so Jack e-mailed him a screen capture of his favorite apps and he printed it out large enough to fit on the poster board (with a little bit of a border). The camera is made of two (very large) buttons from my sewing kit. The home button is craft foam and paper squares. 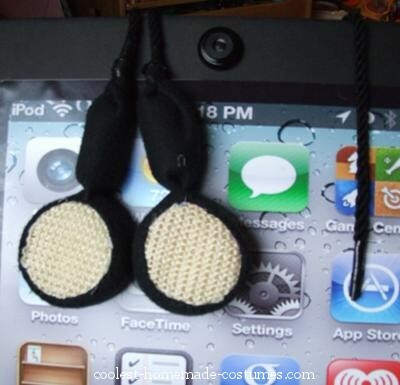 The ear buds are made up of drape cording, bath scrubbies, and mini foam paint rollers covered in fleece (some clever hand sewing and electrical tape). Jack wore a black t-shirt and on the back we used a sheet of silver duck tape and cut out the Apple Inc. logo which really made the costume (the picture I was waiting for). He was a hit at his parties with the adults as much as the kids.